Ministers are to stage talks about restoring a rail link from East Lancashire to Manchester following a local newspaper backed campaign. 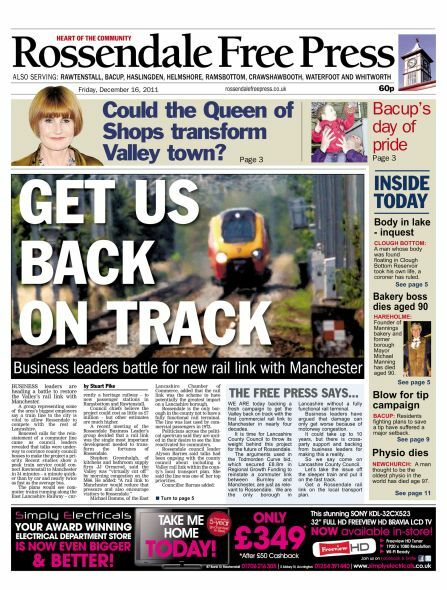 The Rossendale Free Press, along with politicians and business leaders, wants to see a railway line from the borough re-connected with Manchester to enable commuter trains run along the East Lancashire Railway, which is currently a heritage railway. In January MP for the area Jake Berry said the rail link would help create jobs and raise prosperity and called for an urgent parliamentary debate on the matter, which was held this week. The debate saw transport minister Norman Baker voice his support for the scheme and agree to enable officers from Rossendale council to have meetings with his officials to move the project forward. Editor of the Free Press Gareth Tidman said: “A commuter line would be of much more benefit to the people of Rossendale. He added that the picturesque borough was isolated and needed to be put back in the spotlight as it was struggling to find a future. At the Parliamentary debate, Mr Baker said: “I appreciate that the lack of a regular rail service can put an area at a disadvantage, particularly as regards providing access to a major employment centre, such as Manchester. Rossendale is the only borough in the county not to have a fully functional rail terminal, even though the nearby M66 is one of the most congested motorways in the country. The rail link would cost millions and would see commuter trains running along the East Lancashire Railway to new passenger stations in Rawtenstall and Ramsbottom.